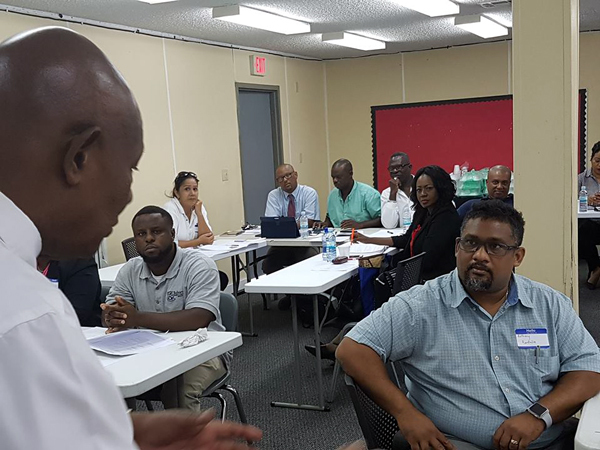 Twenty seven persons from The Bahamas Technical and Vocational Institute (BTVI) were recently in training sessions that focused on City and Guilds’ assessment and quality assurance. 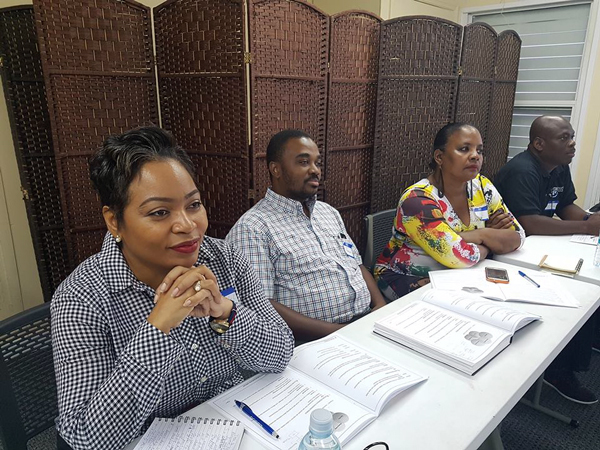 This four-day training in New Providence came as BTVI further readies itself to offer City and Guilds courses and exams since securing accreditation by the United Kingdom-based London Institute. Over in Grand Bahama, Freeport Container Port apprentices started the program in October 2017. They are preparing to sit the City and Guilds Level 3 Diploma in Engineering Maintenance, Installation and Commissioning this fall. Associate Vice President of Academic Affairs, Leroy Sumner, said becoming an approved City and Guilds’ centre is a huge step for BTVI. 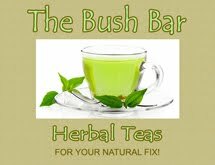 “It has a lot of currency internationally and approval status is a feat in its own right. It tells us that BTVI is on the right track,” said Mr. Sumner. In the workshop, conducted by City and Guilds’ Internal Verifier Professor Gossett Oliver, were Chairs of the trades at BTVI. They will now conduct train the trainer sessions within their respective departments. 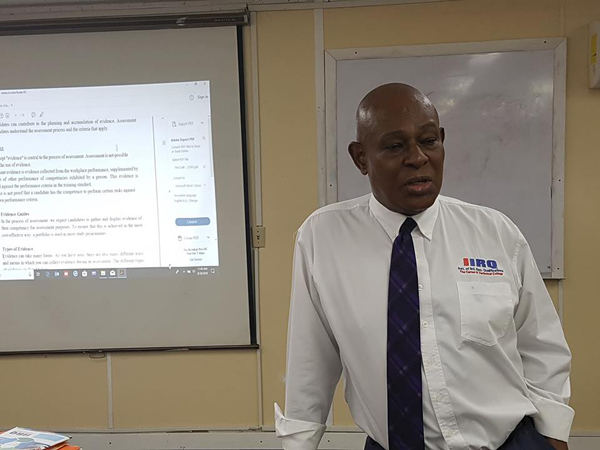 City and Guilds’ Internal Verifier Professor Gossett Oliver, conducted the four-day workshop at BTVI’s New Providence campus. BTVI envisions that as of spring 2019, students will enter the institution in a dual enrollment capacity, taking City and Guilds exams and BTVI exams at the end of the semester. College prep students will be advised to sit levels one and two of the international exams, whereas others will initially be encouraged to sit levels three and four. City and Guilds offers a wide range of vocational qualifications in several occupational areas, ranging across eight levels, from entry to high-order, which are designed for cross-border employment. “City and Guilds’ certificates make one marketable. It’s a known standard accepted worldwide. Being an approved centre indicates to the country and regional partners that we have the ability to deliver up to the mark,” said Mr. Sumner. Instrumental in the process to attaining City and Guilds’ accreditation was a team from Academic Affairs including Mr. Sumner, Associate Vice President for the Northern Campus, Veronica Collie, along with Dean of Construction Trades and Workforce Development, Alexander Darville. Mr. Darville said BTVI is living up to its mission to be globally competitive by firstly being accredited by City and Guilds, in addition to having assessors and internal verifiers. 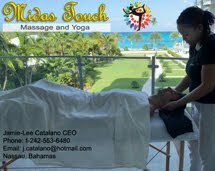 “A certificate at BTVI is stackable. Students can get two certificates: the BTVI certificate and a City and Guilds’ certification. It’s global. It’s transferrable. It strengthens the BTVI grad,” said Mr. Darville. BTVI is gearing up to offer City and Guilds’ courses at its New Providence campus; it has already begun in Grand Bahama. A recent four-day workshop came following the institution’s accreditation by the United Kingdom-based London Institute. City and Guilds has a presence in more than 80 countries and is considered one of the leading skills development organizations. Additionally, Dean of Student Affairs, Raquel Bethel said she found the City and Guilds training to be informative and relevant, having gained a greater appreciation of assessment design and the role that training standards play in the development of curricula. “Just like the workplace has its performance standards, the curricula should also have clearly defined training standards or outcomes, which are required of the learner to be regarded as being competent,” stated Ms. Bethel. “One of the buzzwords of the training was 'evidence’ - evidence being the central pillar in the entire assessment process. I assure you that the impact of this training will become evident in the not too distant future, as we are able to strengthen our existing course offerings through C & G certifications and broaden our reach through the newly trained City and Guilds assessors and verifiers,” she said. BTVI President, Dr. Robert W. Robertson added that securing the accreditation is an important statement of the quality of the institution’s course offerings. “It is a notable achievement that speaks volumes for our team. I also think it would cause BTVI to be even more attractive to prospective students. We live in a globally connected world and we want our students to be at an advantage wherever they go, and of course City and Guilds is internationally recognized,” said Dr. Robertson. City and Guilds has a presence in more than 80 countries and is considered one of the leading skills development organizations.